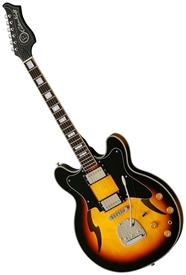 This tribute to the rare 1960's Custom Kraft model made by Supro/Valco. Once again, we cover all the best parts of the originals, but kick it up a notch for modern playability. True in almost every detail to the original, "upgraded" features include the Valco VVDC pickups, a modern roller bridge for tuning stability and a modern Jazzmaster style tremolo for super smooth vibrato. Width at the Nut: 1 5/8""